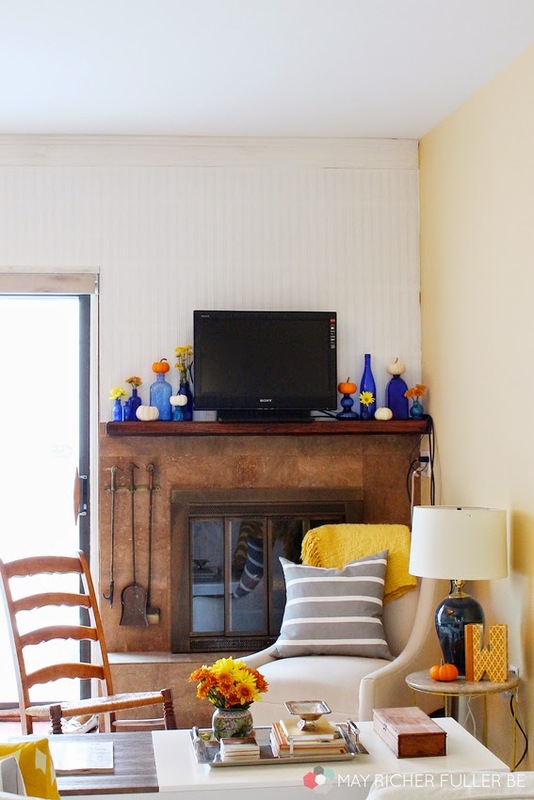 A couple of weeks ago, I shared my progress with covering the enormous wall of tile in our living room with beadboard, and mentioned that I styled up our mantle for fall. Well I'm back today to share some details about the simple things I did to pull it together. I pulled out my collection of vintage bottles since I knew the blue would pop beautifully against the new white backdrop. I inherited every one of these from my grandmother on my mom's side. She had a huge collection, and the girls in the family divided them up when she passed away (yep, she had a ton based on the fact that I have all of these!). They used to sit in her kitchen and I'll always have fond memories of looking at all of them there as a kid when I'd visit :). I'm glad I have them as a reminder of her! 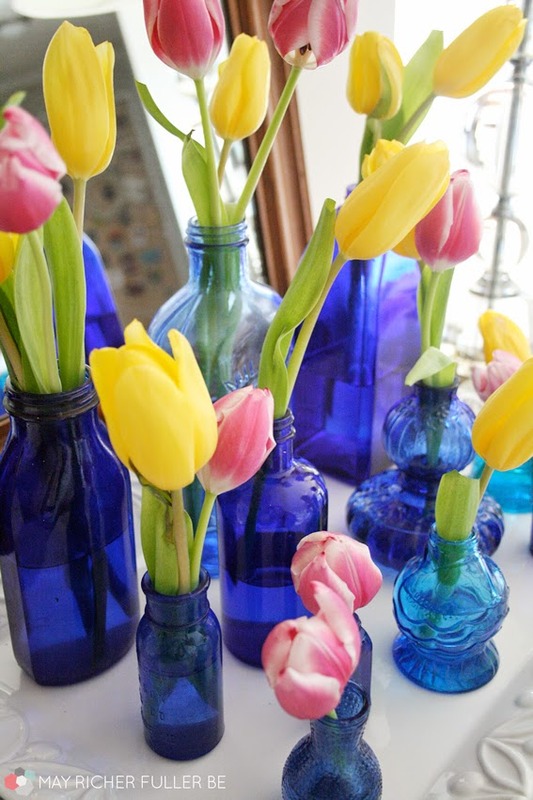 These bottles are timeless and have so many uses. I can imagine a bunch of them clustered together as a centerpiece on a table, a few arranged as a vignette on a table...or up on a mantle like this. Last spring, I gathered several together on a tray and used them as miniature vases for tulips. They were just so pretty! I used that idea as inspiration for my fall mantle. I used a few of the bottles as vases for flowers (which came from Trader Joe's), and used others to vary the height of the mini pumpkins I wanted to incorporate. Height variation makes an arrangement like this much more interesting. I love the semi-random heights of the pumpkins and the flowers. 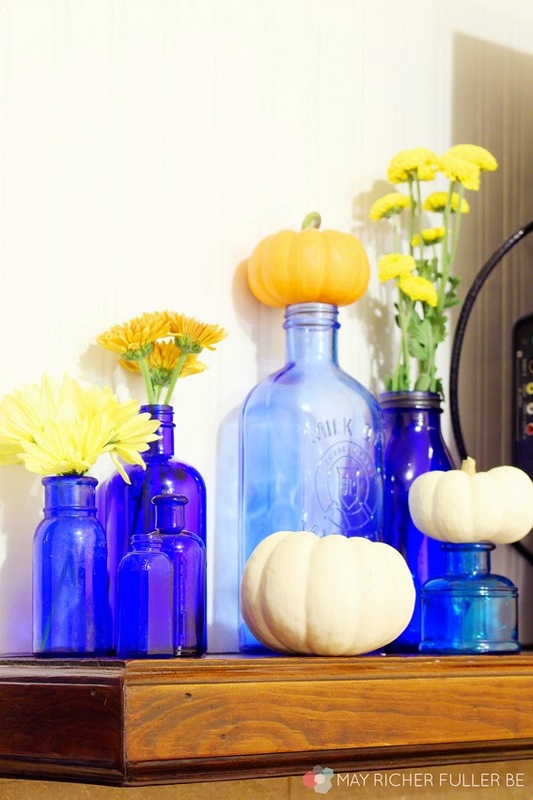 Each bottle has a unique look to it with either pumpkins or flowers (or nothing at all), but it has a balanced look overall. 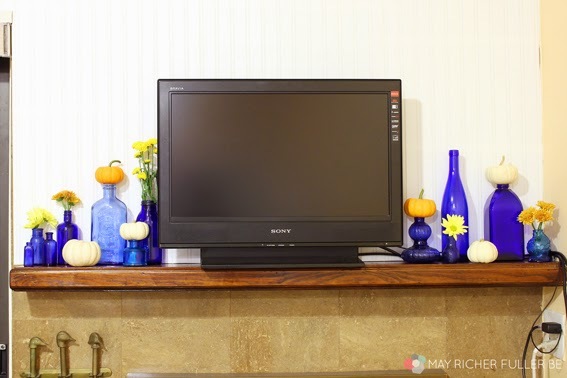 And heck, if a big ole black TV has to sit front and center on your mantle, you might as well make everything around it look pretty, right? Up close, you can see how unique each bottle is - aren't they fun? I especially love that fish one all the way on the right in the photo above. 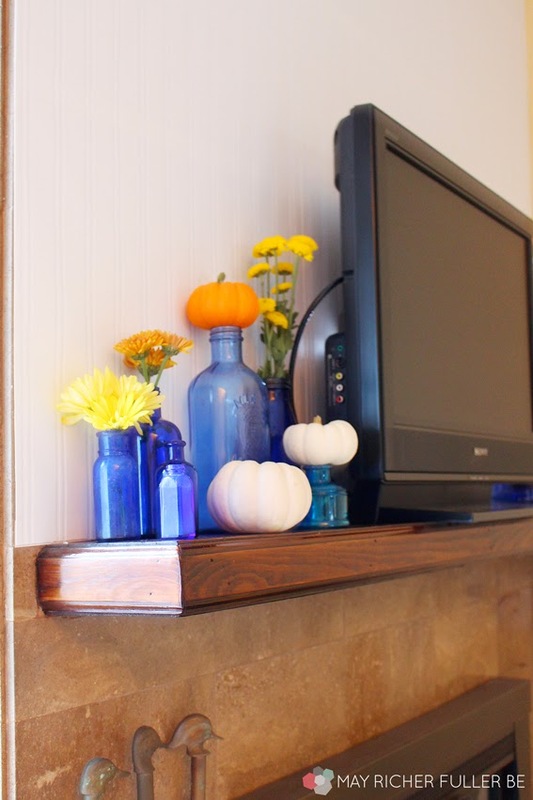 So that's my fall mantle: I shopped the house, bought a few pumpkins and flowers, and kept it simple and fun! 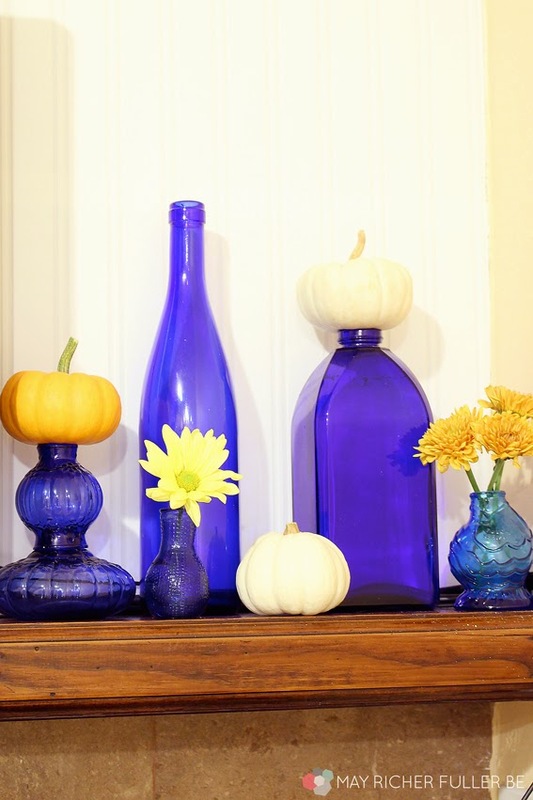 What have you done to decorate for fall around your house? love it! blue and orange is one of my favorite combos- this looks fabulous!